An Ingenious Kitchen Multi-Tasker That Makes Your Life Easier! Pot Holder:The tool's super-flexible silicone and textured surface allow you to grip pots safely, while the back part shields your hand from heat. Move piping-hot items from the cooktop to the counter with ease! Jar Opener: Soft yet sturdy silicone design grips jar lids snugly. Simply twist, and it's off! ★ Dimensions: 7"x 7"x 0.28"
Click "Add to Cart" to Buy Now & Save More when buying multiple sets! SUPREMELY VERSATILES: Our soft & flexible yet strong silicone trivet is the ultimate multi-tasker! Use it as a mat to protect your kitchen surfaces from scalding dishware-or as a pot holder to grip hot pans safely. It also functions as a: large coaster, jar opener and spoon rest! MADE OF HIGH-QUALITY SILICONE: The ultra-flexible, FDA-approved silicone material won't stain, mold, mildew, or absorb odors. It's safe to use in the kitchen and will not change the color or taste of food it touches. Plus, it's heat resistant up to 442°F! MANY EXCITING COLORS TO CHOOSE FROM: Whether you want to match it to your kitchen decor or your personality, our multipurpose trivet comes in many fun, vivid shades of color. Each package includes a set of 2. 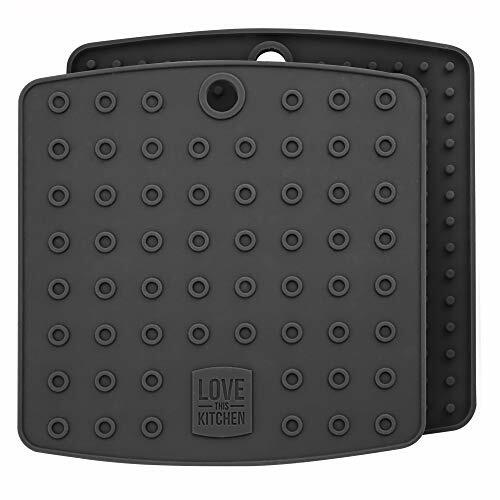 DISHWASHER SAFE: When it needs to be cleaned, simply hand-wash our silicone trivet or toss it into the dishwasher. Virtually everything washes off the nonstick surface with ease-even sticky foods and grease. YOUR PURCHASE IS COVERED BY OUR 60-DAY, MONEY BACK GUARANTEE, and Limited Lifetime Replacement Guarantee. PERFECT AS GIFTS: Delivered in an attractive box, they are perfect for last minute gifts for Birthdays, Thanksgiving and Christmas & they ship fast from Amazon warehouses all around USA, right on time for her special day. Order Now!